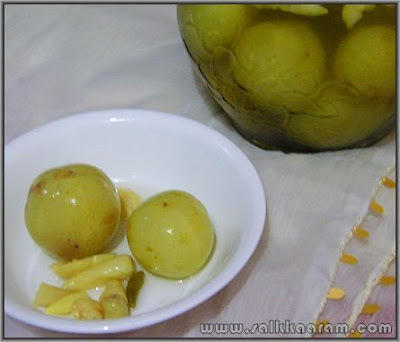 Gooseberries In Brine / Nellikka Uppilittathu | Simple and Delicious ! Wash and wipe the gooseberries. Boil water adding some salt. Put the gooseberries into the boiling water* and switch off fire. Add slit green-chillies into this. Takeout 1/4 part water and add the same amount of vinegar* instead. You can add enough vinegar according to the sourness you like. Check salt and add if needed. Transfer the contents into a jar. Tight the lid, and you can use this after one week. * You can let the water cool and then put the gooseberries. This will take a little long for the gooseberries to absorb the salt well. * If you don't like sourness, avoid adding vinegar. 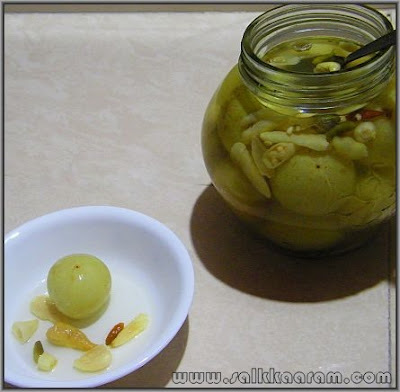 Here's how to preserve Amla in Brine (concentrated salt water) solution without expiry date. Boil water in a large Vessel. Add salt progressively, as and when it dissolves, add more. Continue this till the salt stops dissolving. This indiicates totally saturated Brine solution. Take Vessel off the burner and let is cool to room temperature. excess salt will settle at the bottom of the Vessel. Prepare fresh plump green Amlas by washing the Berries in water and wiping each Berry with a soft cloth to make them dry. Keep under fan to make sure tthey are completely dry. Thereafter, put Amlas in a large Glass or Ceramic Jar till about 1-2 inches from the top max. Pour the Brine solution into this Jar till it fully covers the Amlas. Cover with shrinkwrap to make it air tight, and close lid tightly. Over a period of time, the Amlas will settle down to the bottom of the Jar. They are now matured to be consumed for cooking, making chutneys, etc. Make sure that when you take them out for consuming, you soak the amlas in water for an hour or so to get rid of excess salt. Keep changing the water every 10 minutes or so. I have Amlas preserved for more than 10 years out of which we consume on a few occasions every year. Amlas stored in concentrated Brine solution will last a life time. They may turn dark due to air contact every time you consume some, but they continue to retain their nutritional value. . I have been searching for a good method to store Amlas in brine solution.Yours seems to be a fool proof method.Thanks.